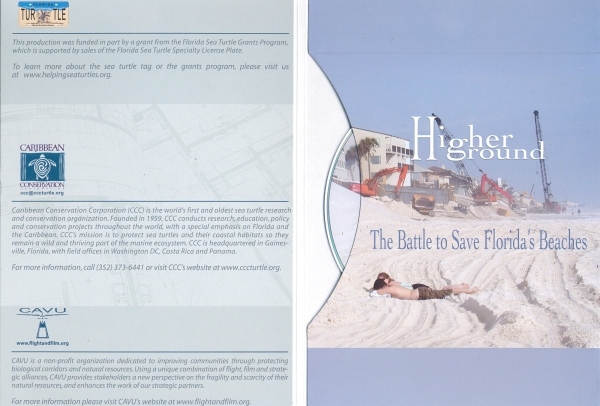 Summary: CCC and its project partner, CAVU (Clean Air Visibility Unlimited), will film, edit, produce and distribute a DVD film that raises awareness among Florida residents, the media and decision-makers about how fragile natural coastline of Florida and its associated sea turtle nesting habitat is being impacted by coastal development, erosion, and various beachfront engineering tactics. The idea is to present a compelling, birds-eye view of some of the most important sea turtle nesting beaches in the state (and the country) to show how human activities on the beach are affecting this habitat. Without giving specific recommendations, the production will present the case that Florida and its citizens are faced with choices that will drastically affect the fate of natural beaches. This project will produce a brief (12-15 minute) DVD that raises awareness about these issues and encourages an open discussion about the coastal policy decisions that will shape the future of Florida coastal resources and sea turtle nesting beaches. The DVD will be produced in quantity and distributed to key state legislators, TV stations, and other relevant media outlets, schools and numerous stakeholder groups.